As Women’s History Month comes to a close, the recognition of strong and powerful women never ends. 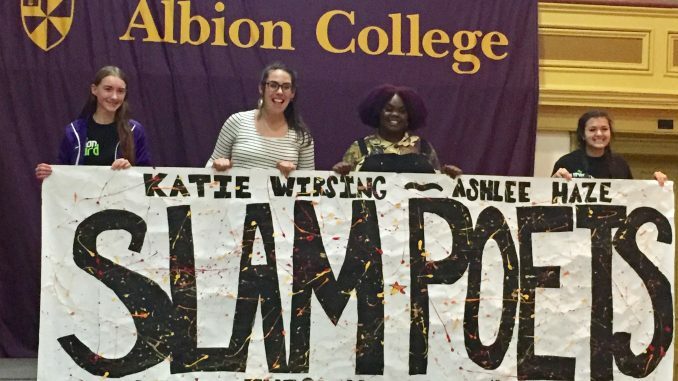 To celebrate women and the great impact and change they bring about, Albion College had the privilege of listening to world-renowned slam poets, Katie Wirsing and Ashlee Haze, speak on the strength of women. Wirsing and Haze welcomed students with utterly profound, inspirational and hilarious poems. They wowed the crowd with their intellect and wit, speaking on a spectrum of subjects, including the ugliness of American society and the beauty of love. As tears were shed and laughs were shared, the poets left all with a resounding appreciation for poetry, and of course, for women. First on stage was Haze, a proud African-American woman that writes on the struggles of her identity: the social issues that come from being African-American, a woman and having a beautifully heavier body. Her love for Waffle House, “This is Us” and Missy Elliot was crafted together with her passion for justice, discourse and change to create spoken word art that left everyone in awe. Not only did the audience feel moved by her poems, Haze herself wrote a poem, “For Colored Girls,” that changed her life. Haze speaks on how she wanted to grow up to be Missy Elliot as a young girl, and how Elliot let her become the strong, independent feminist that she is today. Haze performing on stage at the Kellogg Center Stack. “It was because of Melissa Elliot that I believed that a fat black girl from Chicago could dance until she felt pretty,” said Haze. After writing this poem, Elliot herself showed up at Haze’s front doorstep and thanked her for such an important piece of work. Haze believes it was moments like this that assured her that quitting her day job and following her poetic passion was the right path to take, albeit, a path less traveled. Haze’s amazing creativity and ability to express her beliefs through spoken word landed her astounding awards, like V-103’s “Got Word” Youth Poetry Grand Prize, and the title of Woman of the World Poetry Slam Finalist not once, but twice. She is now on the Executive Council of Poetry Slam, which hosts and judges slam poetry competitions around the nation, and continues to write and judge slam poetry. Second on stage was Wirsing, a new mother, that writes on the LGBTQ+ community, love, generational differences and loss. 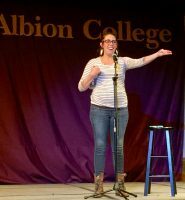 Wirsing’s stories had the audience clapping and whooping of laughter, like the story of her Republican father dressing in assless chaps and enacting a gay rendition of Duck Dynasty at the Denver Pride Parade. Wirsing performing on stage at the Kellogg Center Stack. Her poems also left everyone with tears stinging their in eyes and snapping in agreement. Wirsing opened up her heart and told of the raw emotion with her poem on the recent loss of her father due to cancer. Who would have thought that an Animal House-themed funeral could be so heartbreaking to hear about? The juxtaposition of humor and grief in Wirsing’s poetry set took everyone on an emotional rollercoaster, awaiting the next turn. But, the important messages of queer acceptance, appreciation of love and grief, and empowerment of women still shone through. It was lines like this in Wirsing’s poems that really show that she is in her element and that she also chose the right path to peruse. It was lines like this that show why Wirsing is capable of changing the status quo on LGBTQ+ rights with just a few words. Just like Haze, Wirsing also won multiple awards for her amazing spoken word, like the titles of Women of the World Slam finalist, and National Slam Poetry Champion. Wirsing is an internationally recognized queer and trans rights activist and has been invited to speak nationally on these topics. 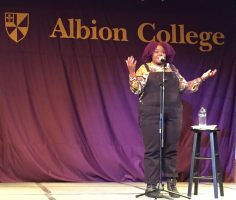 These two poets brought the students of Albion into an emotional awakening, and encouraged all students to embrace their identity with pride and love through their loud, literally and metaphorically, spoken word. For more information on these poets, you can visit www.ashleehaze.com and www.katiewirsingpoet.com.